This page provides you with Physician resume samples that you can use for inspiration in writing your own resume, or for creating one through our easy-to-use resume builder. Below you'll find our how-to section that will guide you through each section of a Physician resume. Physicians are doctors who have completed further training in a medical specialty to diagnose and manage complex medical problems. Physicians treat all sorts of ailments but usually specialise in a particular area of medicine. By specialising, the physician is marking themselves as both a student of and an expert in a particular type of medicine It’s already tough to become a physician, let us make it easy for you to show your best self. Our resume samples have been made to help you stand out from the crowd and have been trusted by over 3 million people. 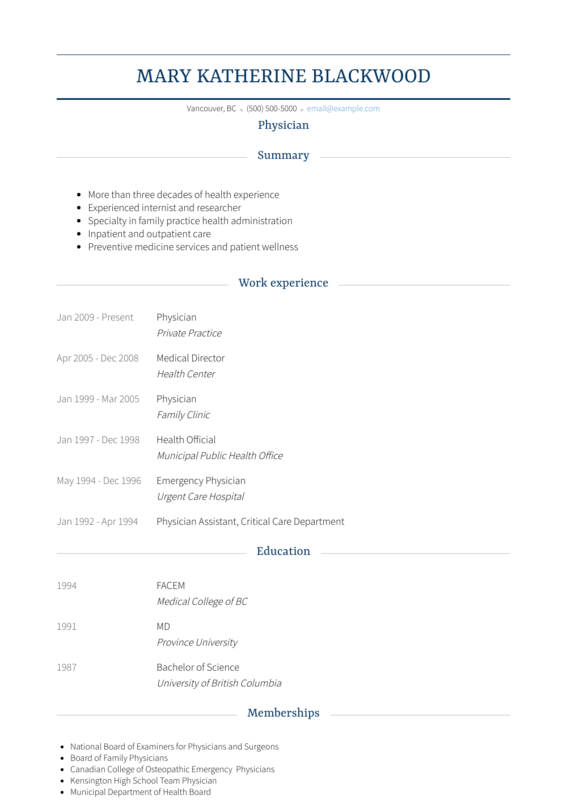 How to Write a Physician Resume? If you want this role, you need to give 100% and get the best Physician resume ever. Let’s start from the format: there’s no doubt the gold medal here goes to the reverse-chronological layout: it presents your freshest wins up front. Last but not least: PDF is the way to go, in order to preserve its formatting! “Is it really needed? Can’t I just write my past experience or education, which shows I’m qualified”. Absolutely Not. Hiring managers receives about many applications for a physician position and each and every one writes about their past experience. This makes it extremely impossible for the manager to decide who to hire, so that’s why a good summary section on top of your resume helps them make a final decision. Skilled physician with 10+ years of exemplary service in the medical field ranging from pediatric to geriatric.Focused team leader who encourages creative problem-solving and consistently exceeds goals. Nationally known expert in physician education method and effectiveness. Dedicated, multilingual physician with stellar academic background, including full scholarship in undergraduate and medical school. Summer experience working in Sub saharan africa administering Polio care to low income populations. Willing to relocate to seek job as a physician. Develop treatment plans for patients with chronic conditions including high blood pressure, diabetes, heart disease, and other problems with internal systems. Lead a team of five resident physicians in the internal medicine department and counsel new staff on procedures and best practices. Collaborated with attending physicians and other residents when delivering top-quality medical care in a fast-paced emergency room department in a hospital. Diagnosed specific medical conditions based on observation, physical examination, wellness history, and patient concerns. Achieved top patient satisfaction scores on post visit surveys, including 98% being highly satisfied with their medical care and advice. Recognized by the hospital of employment as one of the top new residents in the program with high marks from colleagues and patients. For more tips on writing the best work experience section for an efficient product manager like you, check out our detailed resume guide. Education section should clearly show your degrees and certifications you hold which are required in the field by your state or country. You should also use this section to add any certifications you might have that are relevant to your country. Use the table below to add skills relevant for lead pastor in your job descriptions. To show that you’re career driven and really want to become the best in your field, it’s nice to add things that you do outside work and school that lead you towards your goal. Doctors Without Borders , Gave presentation African healthcare sector. Höke, A., Canning, D.R., Malemud, C.J. and Silver, J. (1994) “Regional Differences in Reactive Gliosis Induced by Substrate-Bound ß-Amyloid” Experimental Neurology Vol: 130, pp: 56-66 2. Höke, A. (1994) “Astrocyte Proteoglycans in a Model of Reactive Gliosis” Doctoral Thesis, Case Western Reserve University, Cleveland, OH. Thanks so much for your time: you now have access to standout physician resume sample: if you are also looking for the best physician resume templates, you should check these masterpieces we have been working on here : many professionals like you have successfully used it to take their career to the next level.